Traditionally, olives have been viewed as very healthy food. The fruit provides calories; contain significant amounts of plant-derived anti-oxidants, minerals, phyto-sterols, and vitamins. Olives are a moderate source of calories; 100 g of fruits provide just 115 calories. Their calorie content basically comes from fats. Nonetheless, the fruit composes healthy fat in the form of mono-unsaturated fatty acids (MUFA) like oleic acid (18:1) and palmitoleic acid (16:1) that help lower LDL or "bad cholesterol" and increase HDL or "good cholesterol" in the blood. Research studies suggest that Mediterranean diet, which is rich in monounsaturated fatty acids help to prevent coronary artery disease and strokes by favoring healthy blood lipid profile. Olive fruit contains tyrosol phenolic compounds such as oleuropein and oleocanthal. These compounds are responsible for its bitter and pungent taste. Oleocanthal, oleurpein, and its derivative hydroxytyrosol are nature’s most powerful anti-oxidants. Together with vitamin E and carotenoids, they play a vital role fighting against cancer, inflammation, coronary artery disease, degenerative nerve diseases, diabetes…etc. Studies suggest that oleocanthal has ibuprofen (NSAID) like ant-inflammatory activities. Mediterranean diet that uses olive and its oil may be responsible in part for the lower incidences of coronary artery disease. 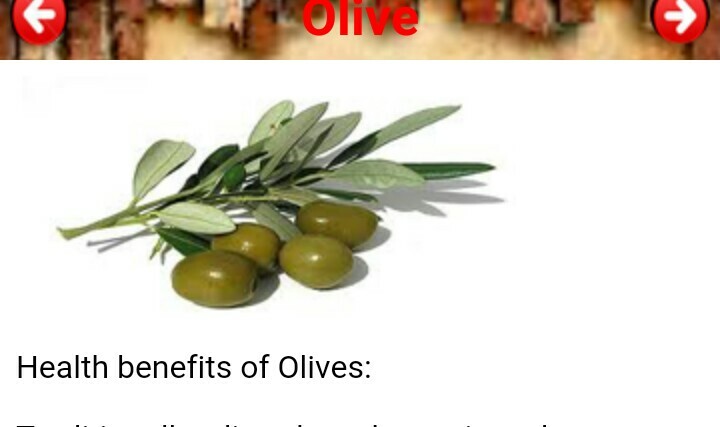 Olive contains a good amount of vitamin E. 100 g cured, and canned fruits provide 1.65 mg (11% of RDA) of a-tocopherol. Vitamin E is a powerful lipid soluble antioxidant, required for maintaining the integrity of cell membrane of mucus membranes and skin by protecting it from harmful oxygen-free radicals. In addition, the fruits contain good amounts of minerals like calcium, copper, iron, manganese, and zinc. Further, they are small sources of B-complex vitamins such as niacin, choline, and pantothenic acid. Oil expressed from these fruits is recognized as one of the healthiest edible oils since it contains less saturated fat, and composes linoleic (omega-6) and linolenic acid (omega-3) essential fatty acids at the recommended 8:1 ratio.